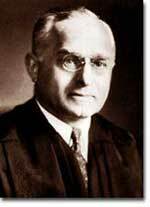 Justice Felix Frankfurter was a huge influence on the Supreme Court in the years he sat on the bench, 1939 — 62. He is noted for his civil rights and anti-trust decisions. Each of these people made sensational headline news as the center of one of many national civil liberties disputes in the late 20th century. They became involved in the legal process because of behavior that violated a law, and almost certainly, none of them intended to become famous. More important than the headlines they made, however, is the role they played in establishing important principles that define the many civil liberties and civil rights that Americans enjoy today. Civil liberties are protections against government actions. For example, the First Amendment of the Bill of Rights guarantees citizens the right to practice whatever religion they please. Government, then, cannot interfere in an individual's freedom of worship. Amendment I gives the individual "liberty" from the actions of the government. Civil rights, in contrast, refer to positive actions of government should take to create equal conditions for all Americans. The term "civil rights" is often associated with the protection of minority groups, such as African Americans, Hispanics, and women. The government counterbalances the "majority rule" tendency in a democracy that often finds minorities outvoted. 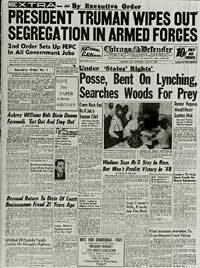 The Chicago Defender, an African-American newspaper, trumpets the desegregation of the military. The right to participate in public institutions is a key component of civil rights. Most Americans think of civil rights and liberties as principles that protect freedoms all the time. However, the truth is that rights listed in the Constitution and the Bill of Rights are usually competing rights. Most civil liberties and rights court cases involve the plaintiff's right vs. another right that the defendant claims has been violated. For example, in 1971, the New York Times published the "Pentagon Papers" that revealed some negative actions of the government during the Vietnam War. The government sued the newspaper, claiming that the reports endangered national security. The New York Times countered with the argument that the public had the right to know and that its freedom of the press should be upheld. So, the situation was national security v. freedom of the press. A tough call, but the Court chose to uphold the rights of the press. The overwhelming majority of court decisions that define American civil liberties are based on the Bill of Rights, the first ten amendments added to the Constitution in 1791. Civil liberties protected in the Bill of Rights may be divided into two broad areas: freedoms and rights guaranteed in the First Amendment (religion, speech, press, assembly, and petition) and liberties and rights associated with crime and due process. Civil rights are also protected by the Fourteenth Amendment, which protects violation of rights and liberties by the state governments. Representatives shall be apportioned among the several states according to their respective numbers, counting the whole number of persons in each state, excluding Indians not taxed. But when the right to vote at any election for the choice of electors for President and Vice President of the United States, Representatives in Congress, the executive and judicial officers of a state, or the members of the legislature thereof, is denied to any of the male inhabitants of such state, being twenty-one years of age [Changed by the 26th Amendment], and citizens of the United States, or in any way abridged, except for participation in rebellion, or other crime, the basis of representation therein shall be reduced in the proportion which the number of such male citizens shall bear to the whole number of male citizens twenty-one years of age in such state. Protection of civil liberties and civil rights is basic to American political values, but the process is far from easy. Protecting one person's right may involve violating those of another. How far should the government go to take "positive action" to protect minorities? The answers often come from individuals who brush most closely with the law, whose cases help to continually redefine American civil liberties and rights. The O.J. Simpson trial in 1995 focused national attention on court procedure and the rights of the accused. Do the civil rights of the United States cover all the rights that they should? Some groups say that the U.S. violates internationally recognized human rights because they aren't included in American law.